Hopefully you’re finding these reflections helpful. Hopefully they’re speaking into you and speaking into your life in a really practical way. I think that’s one of the things we really strive for here at Dynamic Catholic: to speak into your life in powerful ways, but also in very, very practical ways. Ways that you can take and live today, tomorrow, and the next day. One of the things that changed my life is the idea I want to talk to you about today. And when I say it changed my life, I mean it completely changed my life. It completely changed my approach to God and my faith and spirituality. 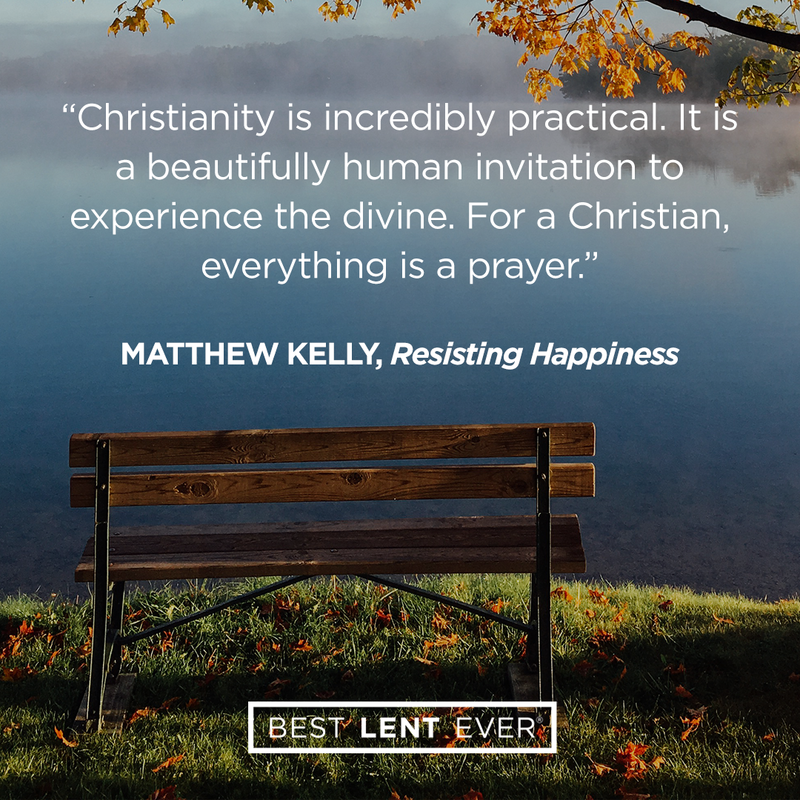 And it’s the idea that everything we do as Christians can be transformed into prayer. St. Paul said, “Pray constantly.” We obviously can’t go into church all day and just pray all the time. Even if we could go into church all day and pray all the time, we’d have to go home and sleep at some point. So what did Paul mean when he said, “Pray constantly”? What did he have in mind? What he had in mind was this incredible idea that everything we do can be transformed into prayer. Even sleeping. We can offer our sleep as a prayer. It’s the idea that every hour of every day can be offered to God for a different reason. Or, whatever. You pick any intention you want, but every day, every hour, as that alarm goes off, you just take 10 seconds to say, “Alright, God. I offer the next hour of my work, or the next hour of my life, as a prayer for this intention. It’s 10 seconds out of every hour, but it changes the way we live. It changes the way we work. When I first heard of the idea I was still a student, and it changed the way I studied. Because, if you really think about offering an hour to God as a prayer for an intention that’s important to you, you approach that hour differently. You just approach that hour with a completely different awareness. And I think that’s part of the problem. I think part of our problem is we’re just not that conscious as we go through the days, and the weeks, and the months of our lives. A lot of the various aspects of our Christian spirituality are just designed to wake us up, because sometimes we really can be sleepwalking through life. So, if it’s time to do the dishes and you hate doing the dishes, do the dishes and offer it as a prayer for some particular intention. And do it well. And pay attention to the details of the work. And do it with joy. Even though you hate doing it, you do it with joy. And you offer that as a prayer. Maybe you hate mowing the lawn—maybe that’s your thing—but every moment of every day can be transformed into prayer. And as we grow in this awareness, it changes the way we live. But it also changes the way we love. Imagine being loved by someone who’s that aware. Every activity can be transformed into prayer. Offer each hour or activity of your day to God as a prayer for a specific intention. Set an alarm to go off each hour. Take a deep breath and lift the coming hour up to God. Ten seconds at the beginning of each hour will change your life. Lord, help me to transform my life into prayer. Inspire me to bring meaning into everything I do so that my presence in the world may elevate and transform ordinary, everyday things. Today’s personal reflection features Dynamic Catholic team member Emma Guzman. Emma is our communications project lead, coming to us from Chicago, Illinois. Emma attended Game 7 of the 2016 World Series (Go Cubs! ), has gone diving in the Great Barrier Reef, and applied to Dynamic Catholic because of Best Lent Ever in 2015. What is an ordinary activity that you can transform into a prayer?